Voices from the Field: RSY vol.26 Let’s make the main signboard for Kizuna Park! / ► RSY vol.26 Let’s make the main signboard for Kizuna Park! 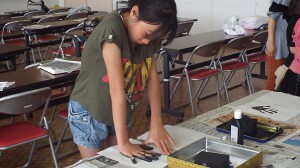 On Sunday, May 26, 2013, we organized a workshop titled, ‘Let’s make the main signboard for Kizuna Park!’ at the Shichigahama Town Central Community Hall. 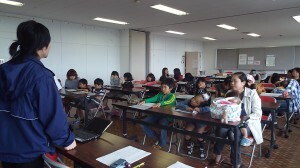 The aim of this workshop was to collect children’s hand prints for making the signboard. Why hand prints for making a signboard? It is based on a suggestion form one of the participants of the previous workshop who said, ‘How about using residents’ hand prints to express ‘kizuna’ (Japanese word for human ties or relationships)?’ We thought this was a great idea and decided to collect the hand prints at the workshop and use them as the basis for the design of the signboard. First, Mr. Ishii, our staff member at Shichigahama, explained the aim of the workshop and the new playground equipment that was going to be set up at Kizuna Park. a multi play set , a monument, a log bench, a signboard, trees, and flower beds. However, at the previous workshop, residents made several other requests: “Horizontal bars are a must!”, “We want benches that are long enough to lie down on”, “Consider crime prevention because it is near the temporary housing”, and so on. Based on such requests, in the end, it was decided to implement the following : a swing set, horizontal bars, three swing-type equipment (including see-saws), security lightings, and endai 1 benches. Those equipment will be provided thanks to the united cooperation of various organizations and corporations. 1 a bench that is long enough for 1 – 2 person, usually made of wood or bamboo. 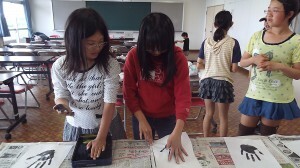 Then, we began the hand-printing. 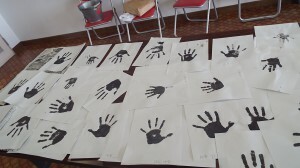 Twenty-four children, from ages 2 to 12, made their hand prints by placing their palms in black Chinese ink and then pressing them on paper. I also tried to make my own hand print. It’s a simple task, but it’s actually quite fun! Mothers helped the toddlers and pre-school children to make hand prints. However, making a good hand print is not easy….You have to put the ink on the right palm and press it down on the paper. In order to make a clear hand print, you need to press down firmly on the fingers and the skin between fingers with the free left hand. When I tried to help with this, the children said, ‘We can do it by ourselves!’ Yes, of course. Here are their hand prints! From the big hand prints that represent children’s growth to the little hand prints that were made with the help of mothers – in all, 24 children’s hand prints were finally ready! Using those hand prints, a design for the main signboard of Kizuna Park is currently in preparation with the cooperation of Ms. Jihyon Ryu, a designer. She is now trying to create a symbolic design using the children’s hand prints as the motif. Please look forward to future updates about ‘Kizuna Park’!